Designed following the relatively poor performance of America's multi-role fighters during the Vietnam War, the F-15 Eagle was conceived as a dedicated air superiority fighter. 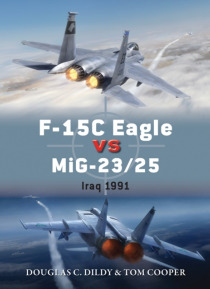 But, having trained for 15 years in the Eagle it wasn't Eastern Bloc operated MiGs that the F-15 eventually came up against, but pilots of Saddam Hussein's Iraqi airforce.This book analyses the combat between the American a… nd Soviet 'Cold War fighters' in a balanced manner, examining how the technical abilities of the aircraft combined with the different levels of training available to opposing pilots and groundcrews allowed the F-15s to destroy the Iraqi offensive abilities within weeks of the First Gulf War starting. Packed with artwork, illustrations and photographs, this book places the reader in the cockpit during one of the last major dogfighting air wars in modern history.